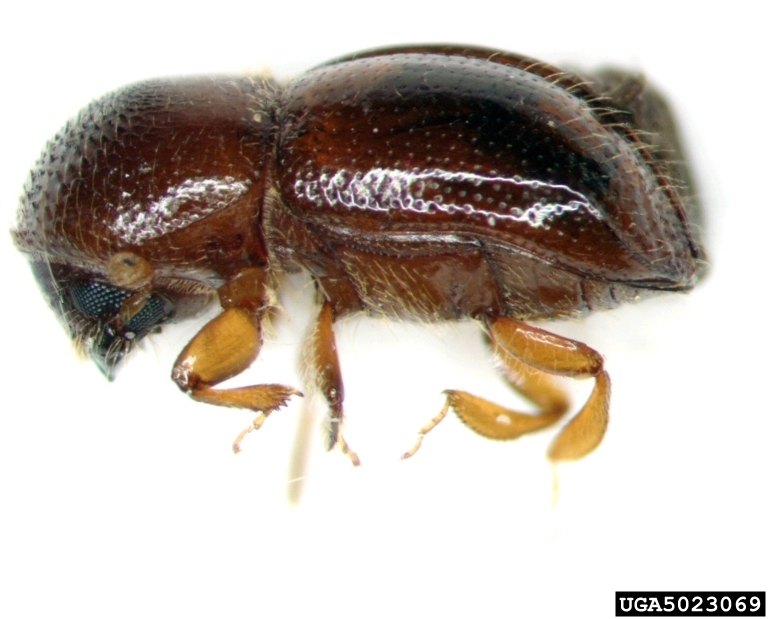 Black Stem Borer: Early Monitoring, Chlorpyrifos Pre-bloom Trunk Applications. Synopsis: Lorsban (Chlorpyrifos) will continue to be available for 2019. The NYS Assembly and Senate are seeking Ag. perspectives on the proposed ban of Chlorpyrifos this coming year as the comment website is now open. Careful and continued assessments of each block with 1-8 year old trees, especially on M.9, G.11, Bud.9 should be made throughout the season. Soil line assessment for dogwood borer in burr knots (M.9) or flaking bark (G.11) and use of ethanol based black stem borer (BSB) traps to monitor for beetle presence followed by careful trunk examination to detect early stages of trunk boring is critical to reducing borer infestations. Pest management planning to prevent the development of both dogwood and black stem borer in the trunks of trees leading to sudden decline in apple. Chlorpyrifos should be strongly considered for directed trunk applications at pink this season, with application directed just prior to BSB boring activity. This application should reduce both Black Stem Borer and Dogwood Borer infestations. The use of the herbicide Rely 280 (Glufosinate-ammonium* 24.5%) should be used with caution in newly planted trees. 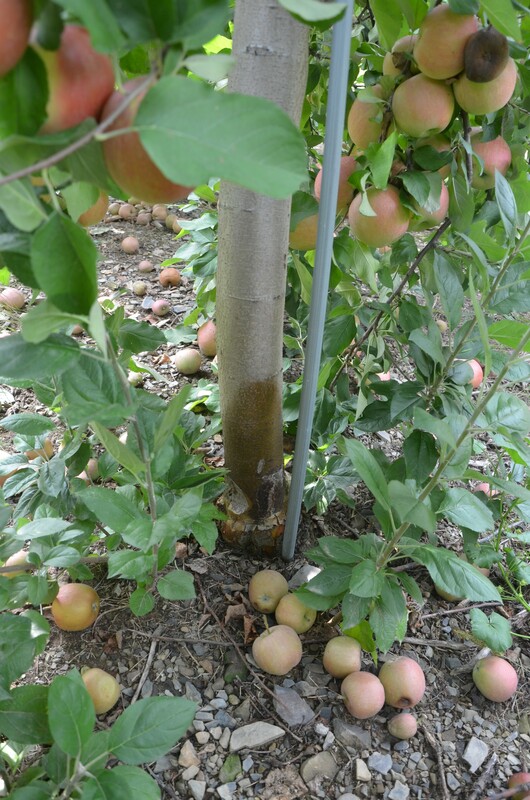 The use of trunk protection with shrouded spray nozzles during applications, especially of Fuji on highly-dwarfing rootstock is extremely important. In this variety bark and cambium cankering and mortality has been documented (Brad Majak-Rutgers). Introduction: An once of prevention is worth a pound of cure. Every grower understands this concept after the first year of losses to insects and diseases. Dr. Rick Wires, our tree fruit entomologist from 1972-1989, would often comment on the use of ‘Revenge Spraying’ to get a better nights sleep well after the damage had been done to a crop. Rick was not recommending this strategy for stress reduction nor did he believe this is a sound economic decision. 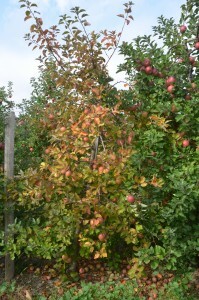 Management will often be needed well on advance of economic loss, during the season in which sudden apple decline events occur. This is especially true in the cases we describe here. 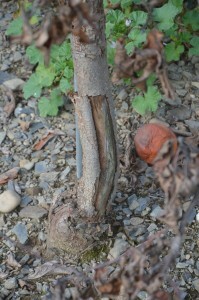 It may be a ‘perfect storm’ of multiple causes, interacting together within specific varieties and rootstock to cause severe decline, or individual events that bring about tree death including the bacterial disease Fireblight, Black Stem Borer or herbicide insult to the trunks of specific varieties. During the past few seasons we’ve seen both early and late season environmental stress affecting newly planted and young well established trees. Stress can be caused by both sever rain (Hurricanes Irene and Sandy in 2011-12) and or seasonal drought (2015). In eastern and western NY, growers are seeing an increasing infestation from black stem borer (BSB), Xylosandrus germanus that are attracted to stress induced trees. To date, we have not seen BSB infestation of ‘healthy trees’. However, in stressed trees, we are increasing seeing the presence of BSB infested trees with trap captures of BSB from Essex to Orange Counties, exhibiting 1mm holes in the trunk and or tell tale ‘tooth pick’ frass during female BSB boring activity beginning during late pre-bloom. Over the years we observed a number of Hudson Valley orchards with severe tree decline leading to tree loss. The first, a block of Fuji on M.9 rootstock in Ulster County with varying degrees of rootstock, union and scion injury just above ground level up to the graft union and well into the scion wood. The second, a block of Zestar, also on M.9 rootstock in Columbia County had near identical injury. Both blocks showed yellowing foliage of weakened trees with near perfect crop load, standing in contrast to the dark green of neighboring trees. Both blocks had the same herbicide active ingredient in weed management programs over the past two years. In Fuji we assessed 121 trees, inspecting three rows in the block and finding over 58% of the trees with varying degrees of yellowing. 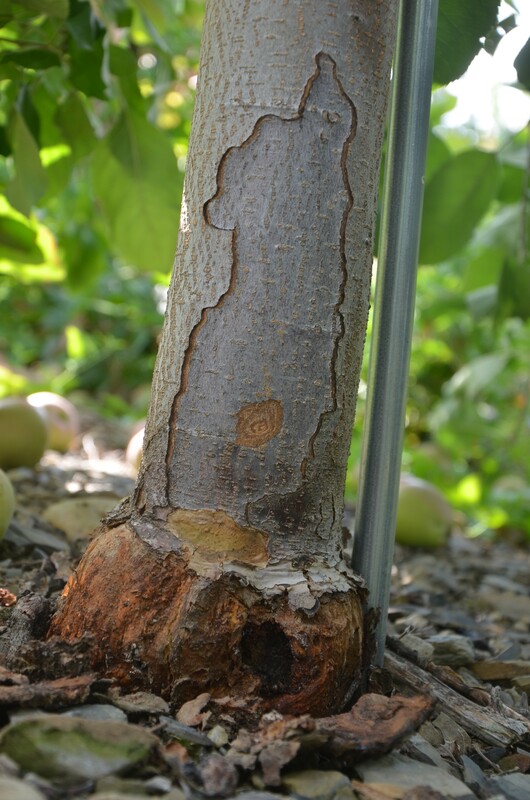 As we dug into the rootstock and base of the scion we found 30% of the trees had lost 100% of their bark just below and above the rootstock graft union. Only 9% of the trees in the block had complete or undamaged bark, the majority without burr knots. 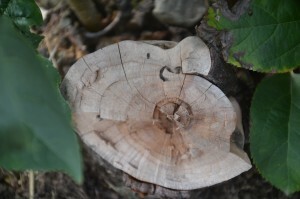 Evidence of dogwood borer feeding, frass and or live larva were found in 52% of the trees while 1mm holes, galleries and sawdust frass indicated BSB in 26% of Fuji trees. 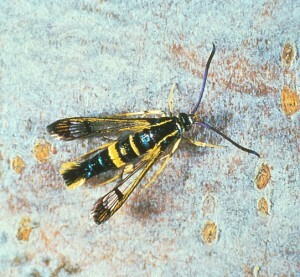 Bark loss was closely associated with the presence of both dogwood borer (DWB), Synanthedon scitula (Harris), and or black stem borer (BSB), Xylosandrus germanus. A very confusing aspect of this sampling showed many of these severely damaged trees had little to no live bark around the perimeter of the trunk, yet they were still completely green, and with a full crop. Over the past weeks many of these trees had transitioned from a ‘completely healthy appearance’ to yellow, then brown, in just a matter of a few days. To date the grower had removed 73 trees in these Fuji rows with increasing numbers of trees showing severe symptoms of decline over time. Adjacent rows with Cameo, Golden Delicious and HoneyCrisp, also on M.9, and on the same herbicide schedule, showed no yellowing or decline. However, in Cameo there is flaking bark and cracking but no signs of cambium decline or bark separation from the wood. The Golden Delicious and Honeycrisp were without any signs of damage to the trunk save the ‘normal’ growth cracking and healing that comes with age. Evidence of black stem borer near graft union. In the Columbia County Zestar block we observed pockets of decline, initially thought to be only from black stem borer. Similar herbicide schedules and active ingredients were used over the past two years, identical to the Ulster County Fuji block. Dogwood borer has also been a perennial problem with live larva present and significant DWB feeding injury found throughout the block. Bark separation from the trunk near the base of the tree of both rootstock and scion was also present. We know that rootstocks, which produce a high number of rooting initials that appear above ground when the graft union is up, such as the M.9 rootstock, are very prone to dogwood borer infestations in the Northeast. The loss of vascular cambium tissue restricts the flow of nutrients and water to the tree causing tree stress as nutrient flow slows within the tree. 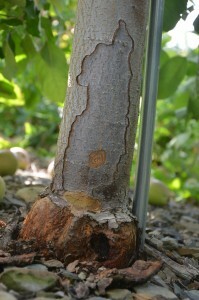 On dwarfing rootstock orchard planting systems with considerably smaller trunk diameter and shallow rooting systems, trees are at greater risk to the impact of disease and insect pests and environmental stresses. The underlying causes appear to be a complex of factors. * the presence of dogwood borer, predominately along the southern side of the rootstock in rooting initials or burr knots below the graft union. The rootstock above ground peeled off, revealing dead wood, fresh frass from DWB feeding, and a high percentage of regions of dying trees with live larva present. 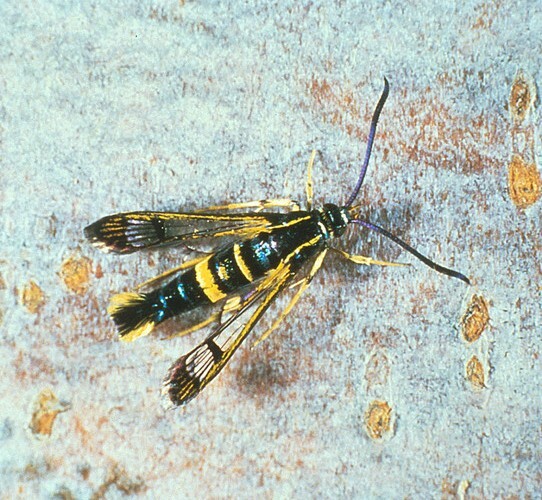 * the appearance of 1mm holds into the dead wood, believed to be that of black stem borer with fresh frass, tunneling and galleries within the heart wood. 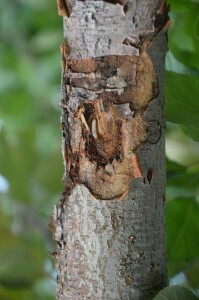 * a defined region of canker radiating upward from the graft union on the north side of the tree. Beneath the bark of the canker was dead wood walled off by live tissue (see images below). We noted the Northwest band of bark to still be wet from the morning dew at noon. It may be that this area of moisture from dew in very dry years would have slower drying time post application of a spray AND act to ‘re-wet’ the region for additional uptake of herbicide with long residual. The canker on a number of the dead trees had split open. * herbicide strips in the two farms were impeccably clean, free of weed plants. There may be the possibility of residual herbicide injury causing cankers where overlap of high rates of spray and slow dry time causes re-wetting and re-absorption of the active ingredient. Was this exacerbated by the wounding by DWB and subsequent absorption and uptake of herbicide into these freshly wounded sites? In years of drought, super spindle trees without adequate irrigation will undergo increasing stress that may increase the risk of herbicide injury. This appeared to be the case in the use of Rely. Brad Majek, weed scientist in New Jersey, published a warning in 2014 about the potential phytotoxicity to tree fruits from glufosinate herbicide (Rely and generics). 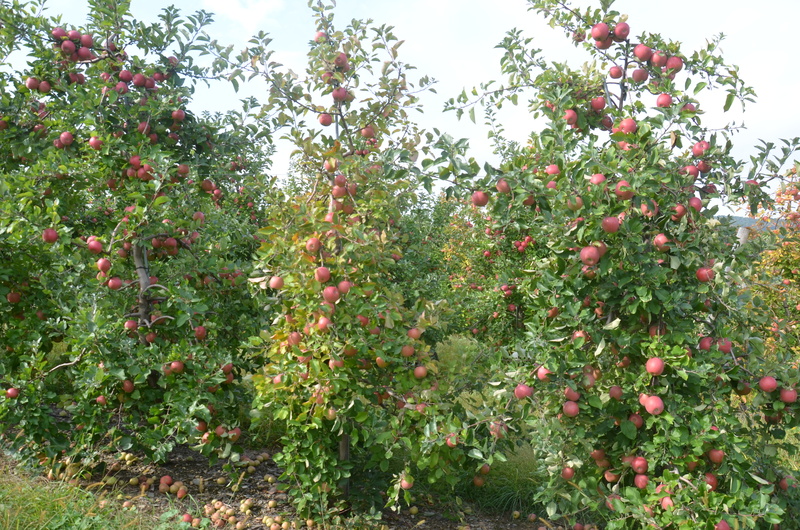 In conversations with Rutgers they state Fuji have exceptionally high susceptibility to trunk injury from Rely. His short article appeared in the Rutgers Cooperative Extension Plant and Pest Advisory. 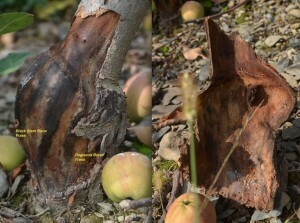 One of the photos in Brad’s article looks very similar to the damage seen in many Hudson Valley apple orchards. Desiccation from herbicide exposure combined with normal water stress during hot dry periods may predispose the trunks to invasion by Botryosphaeria dothidea, a canker pathogen that is incapable killing the cambium in healthy functioning trees, but which becomes very pathogenic in drought-stressed trees. Gramoxone can also contribute to similar trunk damage, especially on young trees (Observations from Dr. David Rosenberger). Minimizing the use of herbicides that might injure the bark and cambium layer is yet another important factor in reducing tree stress. If injury from herbicide causes restriction in the cambium layer, reducing movement in phloem and xylem cells, the tree will be unable to transport nutrients and water. This in and of itself may lead to BSB infestations. The importance of Dogwood borer management cannot be overstated, and is certainly implicated in contributing to the collapse of these trees. In new planting systems consider the Geneva rootstock series with the best match between rootstock and scion. They tend to throw fewer rooting initials above ground and will dramatically reduce the population of DWB. Irrigation, especially in soils that drain quickly such as sandy loam, shale or alluvial till, is essential as the trees go into the ground. New plantings of high density fruit on well drained soils should be under regimented irrigation shortly after planting as root systems are developing. Establishing the rooting zone, pushing the extension leader and developing fruiting wood is critical to the productivity and longevity of a high density block. A topic for future research will need to include the influence of DWB and herbicide / trunk interaction on the development of stress of young trees to produce ETOH leading to BSB infestation. Subsequently, do the fungal pathogens that are introduced to the tree by the adult to feed its young, give rise to cambium decline at the base of the tree? Secondarily, does the influence of herbicide on the trunk of trees play a role in cambium decline leading to bark death and separation. We hope to begin the process of answering these questions in small plots studies beginning in 2016. Farming is Hard! The first eight to ten years in the life of a tall spindle system is one that requires unending attention to detail. Highly dwarfing rootstock, especially M.9, will hound even the stoutest of growers with a ruthless and unending barrage of tree stresses that are unforgiving in rehabilitation, leading to failure if left unattended. A single weak link in these systems can lead to rapid decline of entire blocks. As we commit to growing more fruit per acre, one’s tenacity and commitment to effective diligence and detail in all areas of production also needs to flourish. Northwest Trunk Canker, possibly re-wetting from herbicide application residue in a dry year?